The dividend inflows into government coffers comes at a time when New Delhi is front-loading expenditure. Reserve Bank of India transferred Rs 30,660 crore to government this year. 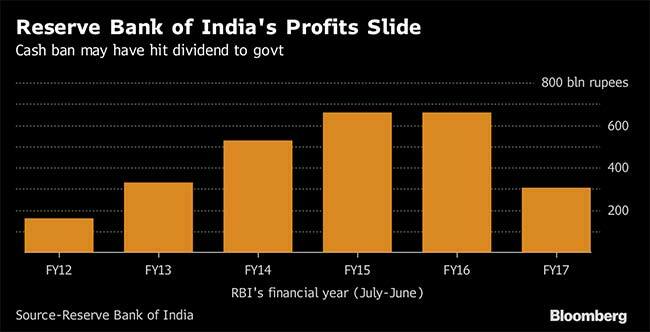 The Reserve Bank of India halved its annual dividend to the government, a move that's likely to put a strain on public finances and imperil Prime Minister Narendra Modi's aim of reining in the fiscal deficit. Marking a five-year low, the Reserve Bank of India transferred Rs 30,660 crore ($4.8 billion), which was more than 50 percent lower than the Rs 65,876 crore transferred last year. The central bank sends a dividend every year after closing its accounts in June. Bloomberg Quint reported earlier this year the government budgeted an inflow of Rs 58,000 crore from the RBI, with the dividend being paid out of its surplus generated from market operations and investments. The fall in the RBI's dividend is a matter of concern, Finance Ministry officials said, declining to be named citing rules. They expect the shortfall to be met through direct taxes and a surplus from demonetization, and don't see the need to cut expenditure. Finance Ministry spokesman D.S. Malik could not immediately be reached for comment. There were expectations that the unprecedented cash ban PM Modi imposed in November would lead to a windfall. The government had estimated that about Rs 5 lakh crore of the Rs 15.3 lakh crore sucked out by PM Modi's move would stay undeclared as it may have escaped the tax net illegally. 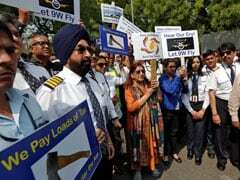 But Indians returned 97 percent of currency rendered illegal before the Dec. 30 deadline, according the people familiar with the issue, implying not much of a windfall for the RBI which is the issuer of the currency. With a lower inflow from the central bank, the government will be under pressure to achieve its asset sales target of Rs 72,500 crore in the year ending March 2018. Typically, the RBI must back every note issued by an asset -- namely a government bond, gold or foreign assets. In a one-time event like the cancellation of notes, the central bank no longer needs to honor the commitment to pay on the notes that were not returned to it, thereby extinguishing its liability and translating into a potential profit. 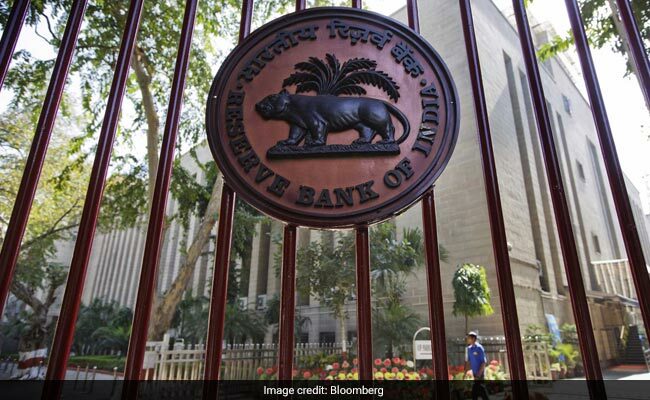 The decline in RBI dividend "can be attributed to costs related to demonetization," Citigroup Inc. economists Samiran Chakraborty and Anurag Jha wrote in a note on Thursday. These included "liquidity sterilization through term reverse repo operations and note printing costs considering the vast re-monetization exercise that was carried out." "The cash ban has impacted the RBI's surplus," said Anjali Verma, chief economist at PhillipCapital India Ltd. in Mumbai, referring to the cost of printing the new notes after the cash ban was announced. "The government will now have to rely more on disinvestments to meet its deficit targets." The dividend inflows into government coffers comes at a time when New Delhi is front-loading expenditure. That has seen the federal budget shortfall reach 81 percent of the fiscal-year end target in the first three months to June, raising questions whether the country can meet its deficit target. "The data indicates that revenue collection is slightly above trend, but expenditure has been front-loaded even more aggressively than the previous year, leading to a sharper jump in budget deficit relative to trend," said Kaushik Das, chief India economist at Deutsche Bank AG. "From a fiscal perspective, this should not be much of a concern, as the government will calibrate its spending in the second half," he said, adding the expenditure will help support growth in the April-June quarter by offsetting some of the weakness that was caused by companies de-stocking before the introduction of the goods and services tax on July 1. India's budget shortfall is forecast to be 3.2 percent of gross domestic product in the year to March 2018. While that would be smaller than the previous year's 3.5 percent, it's wider than the target of 3 percent. New Delhi has slowly brought it down from 5 percent of GDP a few years ago. But the deficits are actually widening at the state level -- leaving India's financial position essentially unchanged from 2012, before PM Modi took power. The lower surplus amount transferred by the RBI was a concern as other state-run banks who also pay dividends to the government are struggling, said Madan Sabnavis, chief economist at Care Ratings Ltd, Mumbai. "If other conditions remain unchanged, the fiscal deficit can increase from 3.2 percent to 3.4 percent this year." What's more, the problem is likely to get worse as populist farm waivers and other spending sprees pick up ahead of the general election in 2019. "State finances have been under stress in the past few years with aggregate fiscal deficit increasing 60 basis points in the last four years," said Ashutosh Datar, an economist with IIFL Institutional Equities in Mumbai. "Although media attention is focused on farm loan waivers, the real known risk to state finances is deferred implementations of pay commission recommendations. 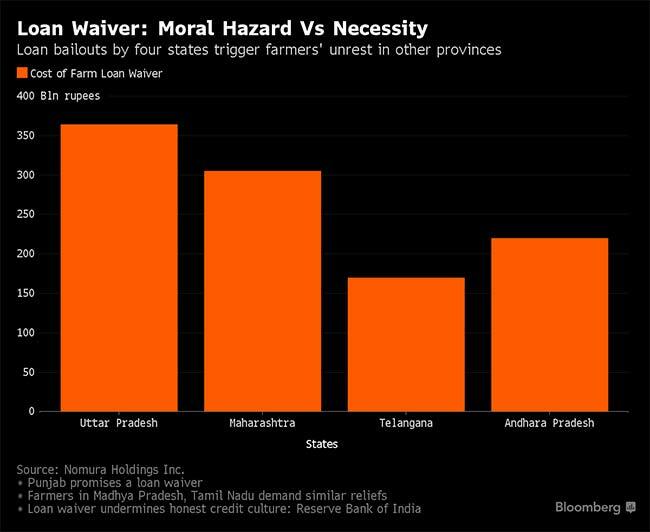 The incremental wage bill of just four states -- Maharashtra, Punjab, Rajasthan, Tamil Nadu -- will be the same as the farm loan waivers."